Everybody wants to know how to prevent cancer, as evidenced by the many thousands of articles dedicated to the subject. Unfortunately, many of these headlines make claims about how to prevent cancer that exaggerate or misrepresent what studies find. The truth is that no single food, not even broccoli, will thwart one of the oldest diseases on the planet. But many of the common tips to reduce cancer risk — quit smoking, eat healthy and limit or avoid alcohol, exercise, and get screened for some cancers and vaccinated for others — are based on decades of cancer research. Raising awareness about ways to reduce cancer risk is essential, says Sue Gapstur, PhD, MPH, vice president of the ACS epidemiology research program. She points to alcohol as one clear example of a well-documented cause of cancer that many people do not even know about. “We have known that alcohol causes some types of cancer since the early 1980s. In the US it accounts for 3.5% of all cancer deaths. Alcohol intake is an underappreciated but easily modifiable cancer risk factor,” explains Gapstur. Researchers are trying to tackle many of those challenges one study, one community, one policy at a time — because we can’t achieve any vision of the end of cancer without preventing massive numbers of people from getting it in the first place. A big part of the problem according to American Cancer Society Chief Medical Officer Otis Brawley, MD, FACP, is applying what we already know. “We have 120-year-old research that is not being applied to everyone today,” says Brawley. Disparities, such as issues with access to care and proper information, cause many people to delay going to the doctor, which means they are more likely to get a cancer diagnosis when it is already more advanced and harder to treat. These issues extend to straightforward prevention tactics as well, like eating the right foods, exercising, and getting routine cancer screening tests. 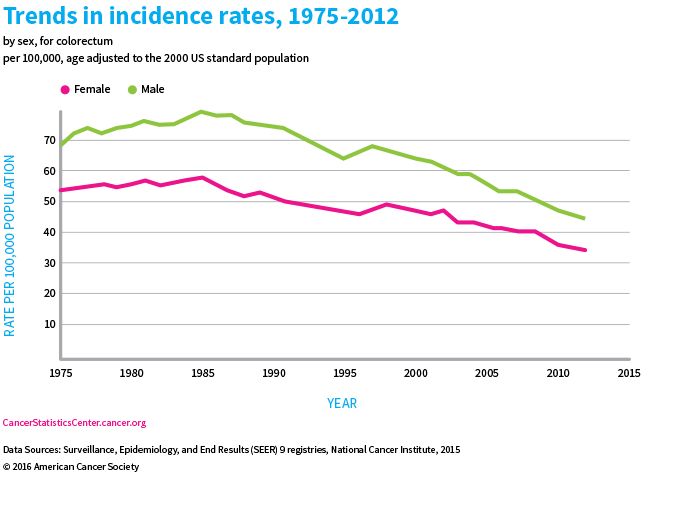 There are a number of significant cancer prevention success stories in recent history. Colorectal cancer has been a continuing success story. The death rate has been dropping for decades, due to prevention and early detection, partly because of an increase in screening, as well as improvements in treatment. Researchers expect the numbers to get even better. The National Colorectal Cancer Roundtable, a coalition that includes the ACS and the Centers for Disease Control and Prevention (CDC), aims to get 80% of adults 50 and older regularly screened for colorectal cancer by 2018. The “80% by 2018 ” effort would prevent 277,000 new cases and 203,000 deaths from colorectal cancer by 2030, according to a study in Cancer co-authored by Ahmedin Jemal, DVM, PhD, vice president of surveillance and health services research at ACS. Cervical cancer prevention has been a big win for women. In the 1940s, cervical cancer was a major cause of death among women of childbearing age. But because of prevention and early detection with the Pap test, the rate of invasive cervical cancer has plummeted more than 70% since the late 1960s. And future generations might have much lower rates of cervical cancer, thanks to the new HPV vaccines that prevent infection with 9 types of the virus, including HPV 16 and HPV 18, the two that cause most cases of cervical cancer. The challenge will be to get vaccines like these, as well as essential screenings, and support for crucial lifestyle changes (in particular, quitting smoking and achieving a healthy weight) available to everyone who would benefit from them. The American Cancer Society’s research news team. What Will It Take to End Cancer? We are talking to some of the top minds in cancer research to figure out exactly what they think needs to happen to end cancer as we know it. A publication of the American Cancer Society.